Pictured, left to right, are OhioHealth Grady Memorial Hospital President Steve Bunyard, and Hayes Heritage Fund Committee members Bill Rietz and Jack Hilborn. Rietz is pictured holding a replica of the 7-foot statue of President Rutherford B. Hayes that will be placed in downtown Delaware. The committee this week announced a $25,000 gift from OhioHealth for the project. Appropriate honor for Delaware’s most distinguished native, 19th United States President Rutherford B. Hayes, is long overdue but now significantly closer to becoming a reality after a gift from a local healthcare provider. The Rutherford B. Hayes Heritage Fund, leading the “Hayes Comes Home” project to erect a statue in Delaware, announced a $25,000 gift from OhioHealth on Wednesday. With the gift, the fund is nearing the $70,000 mark. The ultimate goal of organizers is to raise $125,000. Included in the total cost of the statue that is destined for downtown Delaware is the refurbishing of the existing fountain at the plaza on the southwest corner of William and Sandusky streets, and the accompanying signage detailing Hayes’ life. The goal of the grassroots committee is to unveil the 7-foot statue on Friday, Oct. 4 — Hayes’ birthday. The event will coincide with a Main Street Delaware First Friday event. 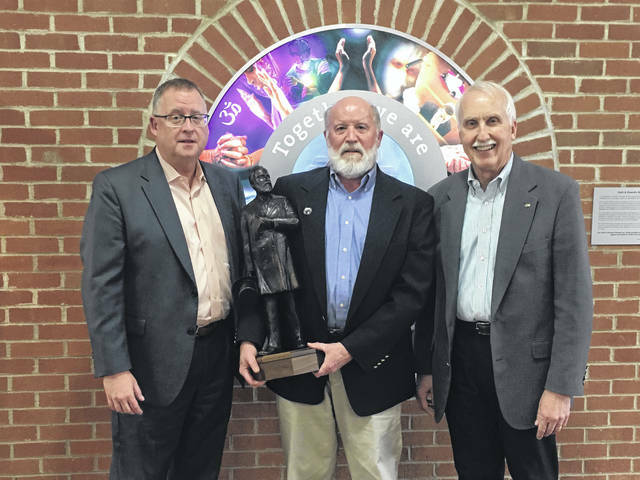 Ohio artist Alan Cottrill was selected in July to create the statue. His previous creations include Woody Hayes and Jesse Owens statues on The Ohio State University campus, as well as the Thomas Edison statue in Statuary Hall at the U.S. Capitol. Other than the small plaque in front of his birthplace, now the BP gas station on William Street, there is little recognition of Delaware’s native son around the city. In addition to the statue downtown, the committee has plans for a bust of Hayes that will adorn the atrium of Hayes High School. Prior to his presidency from 1877-81, Hayes served as a general in the Civil War, as governor of Ohio for two terms, and in the United States House of Representatives from 1865-67. For more information about the Rutherford B. Hayes Comes Home project and ways to donate, visit www.hayescomeshome.org.